SoleMassager Exercising Under Desk Footrest This item cannot be shipped to APO/FPO addresses. Please accept our apologies. 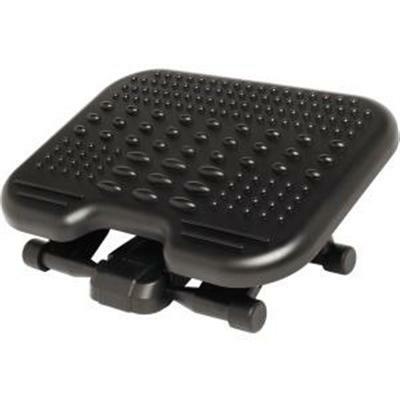 Suits areas with restricted work space; Ergonomically designed to promote comfort; Rocking motion helps improve circulation & reduce fatigue; Adjustable height from 2.75" - 4"; Unique tread design holds foot rocker in place while in use; Dim: 5.19"
PROFESSIONAL SERIES BACK SUPPORT BLACK. 2-tiered support system features a mid spinal support for good posture and a lower lumbar support that conforms to natural body curvature. Tri-Tachment system eliminates the need for readjustment. Memory foam cushions self-adjusts for custom support. Fits most office chairs. This item cannot be shipped to APO/FPO addresses. Please accept our apologies. Provides computing comfort for an economical price. Encourages a neutral wrist position with sturdy comfort. Long enough to fit most standard keyboards. Natural rubber backing is nonskid and sturdy. 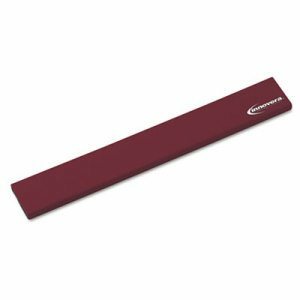 Wrist Filling Material: Natural Rubber; Mouse Pad/Wrist Rest Type: Keyboard Wrist Rest; Color(s): Burgundy; Theme: Solid Color. Innovative surface is softer than fabric and smoother than other gel rests. 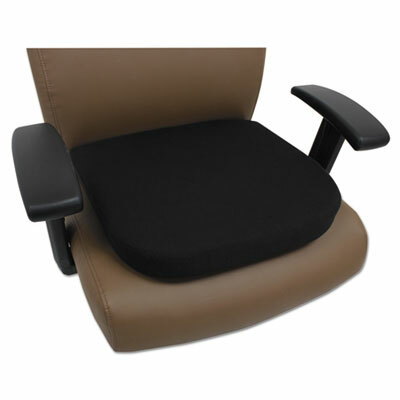 Provides the all-day comfort and ergonomic support computer users need. Stain- and water-resistant surface wipes clean easily. Nonskid rubber backing keeps rest from slipping. Wrist Filling Material: Gel; Mouse Pad/Wrist Rest Type: Keyboard Wrist Rest; Color(s): Black; Theme: Solid Color. STANDARD FOOTREST GRAPHITE. 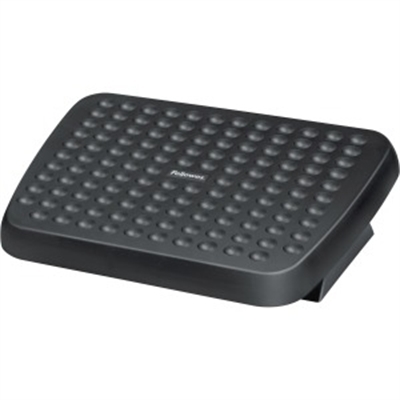 Fellowes Standard Footrest offers dual-position height adjustment with a free-floating platform that lets you stretch your legs for increased circulation. A textured surface massages the soles of your feet for stress reduction. This item cannot be shipped to APO/FPO addresses. Please accept our apologies. 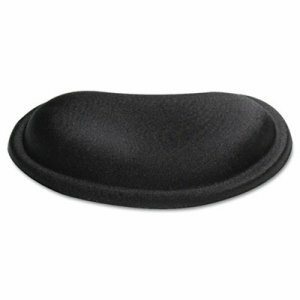 Soft gel provides cushioned comfort while performing computer functions. Stain- and water-resistant surface is easy to clean. Gel helps displace pressure points and maintain a neutral wrist position. Nonslip rubber backing keeps pad in place. Wrist Filling Material: Gel; Mouse Pad/Wrist Rest Type: Keyboard Wrist Rest; Color(s): Blue; Theme: Solid Color. Soft cushioning gel conforms to your wrist for all-day support. Smooth fabric reduces wrist irritation. Keeps wrists in a neutral position for ergonomic comfort. Classic look matches any d�cor. Wrist Filling Material: Gel; Mouse Pad/Wrist Rest Type: Keyboard Wrist Rest; Color(s): Black; Theme: Solid Color. Provides computing comfort for an economical price. Encourages a neutral wrist position with sturdy comfort. Long enough to fit most standard keyboards. Natural rubber backing is nonskid and sturdy. 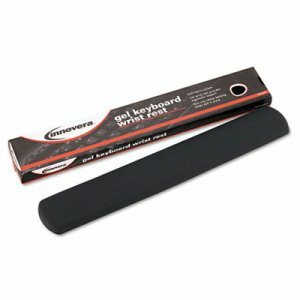 Wrist Filling Material: Natural Rubber; Mouse Pad/Wrist Rest Type: Keyboard Wrist Rest; Color(s): Black; Theme: Solid Color. Half-cylinder padded design allows infinite positioning for ultimate comfort. Hypoallergenic medical-grade foam distributes weight evenly. Machine washable. Nylon cover with nonslip tread. Width: 17 1/2"; Height: 6 1/4"; Depth: 11 1/2"; Color(s): Black. 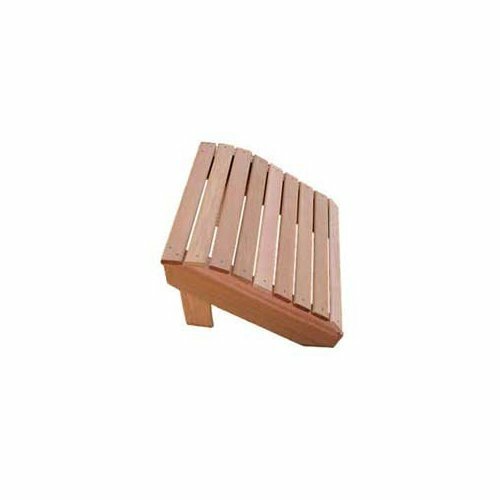 The Adirondack Foot Rest is light weight, easy to move and gives great comfort with all the Adirondack chairs and settees. Made from 100% Western Red Cedar. Western Red Cedar does not absorb water or lose water as fast as other woods making it the ideal material for outdoor furniture - it does not warp, crack, bow, or check as much as other woods. Cedar also contains oils that are a natural insect repellant. Cedar resists decay, disease and rotting. Comes with Zinc Plated Hardware. Dim: 22"L x 12 3/4"H x 20"D.
Provides computing comfort for an economical price. Encourages a neutral wrist position with sturdy comfort. Long enough to fit most standard keyboards. Natural rubber backing is nonskid and sturdy. Wrist Filling Material: Natural Rubber; Mouse Pad/Wrist Rest Type: Keyboard Wrist Rest; Color(s): Blue; Theme: Solid Color. Tilting footrest for proper ergonomic alignment. Clever foot adjustable tilt mechanism rolls back and forth for your ideal angle from 0 to 20 degrees. Ribbed surface prevents feet from slipping. 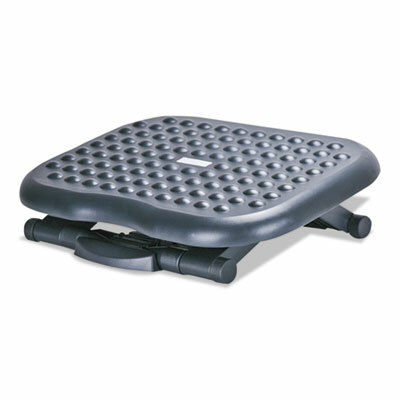 Non-slip, non-scratching floor pads keep your footrest in place on the floor. Width: 13 3/4"; Height: 3 3/8" to 5 1/8"; Depth: 17 3/4"; Color(s): Black. 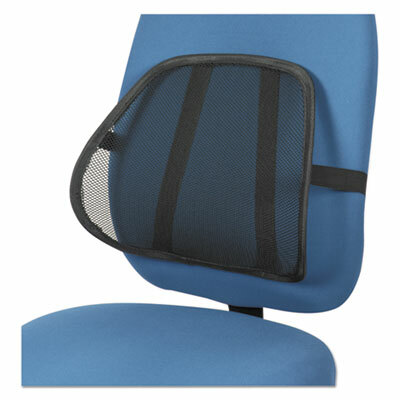 Ergonomically designed stretched mesh backrest supports the lower back. Contoured shape and curves to keep the back in alignment. Breathable mesh fabric keeps the back cool and supported. Adjustable elastic straps secures backrest in place. Great with office chairs, car seats, or in the home. 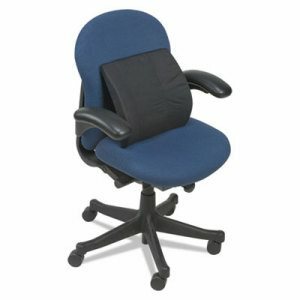 Back Support Type: Chair; Material(s): Mesh; Color(s): Black; Straps: Yes. Provides precise ergonomic foot support for any user. 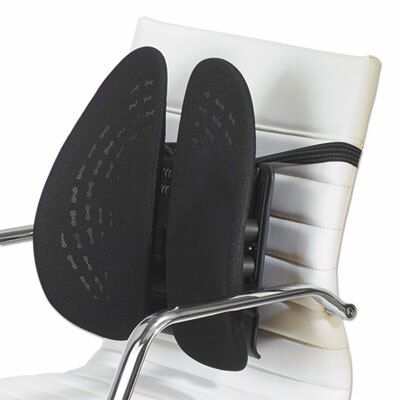 Comfortable cushioned footrest helps reduce strain on the feet. Non-slip anti-fatigue cushioned mat. Clever foot adjustable tilt mechanism. Two tilt positions at 20 and 40 degrees as well as two height-adjustable positions. 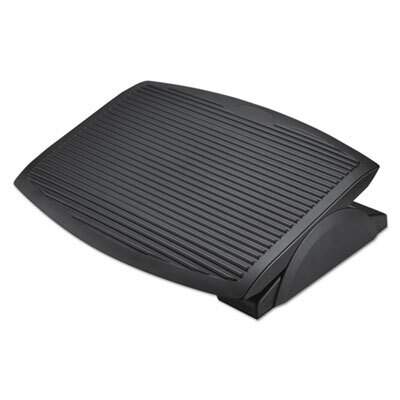 Non-slip, non-scratching floor pads keep your footrest in place on the floor. 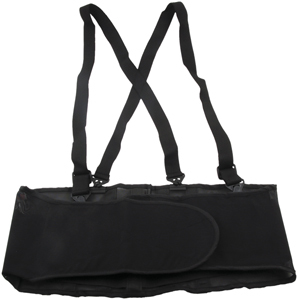 Width: 14"; Height: 3 3/4" to 7 1/2"; Depth: 19 5/8"; Color(s): Black. Provides precise ergonomic foot support for any user. 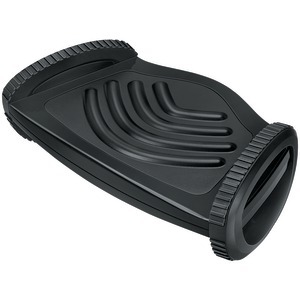 Designed with roller surface bumps to both help massage tired feet and keep your foot from slipping. Three tilt positons from 20 to 70 degrees and three height-adjustable positions. 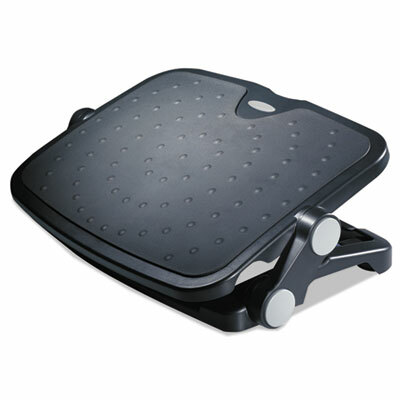 Non-slip, non-scratching floor pads keep your footrest in place on the floor. 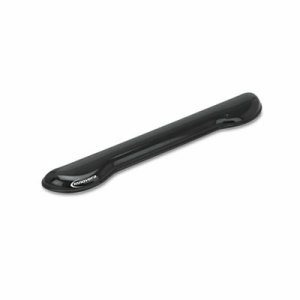 Width: 13 3/4"; Height: 4 1/2" to 6 3/4"; Depth: 17 3/4"; Color(s): Black. 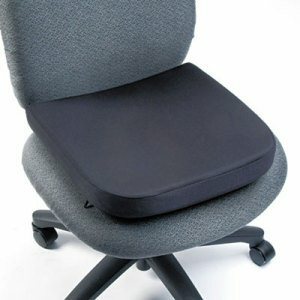 Unique, patented back support technology provides firm and comfortable support to back posture on any chair. Four independent springs articulate the ventilated panels to conform to your body shape and position. Fabric covers are easily removable and machine washable. Easily adjust support height to customize fit to body type/size with the patented SmartFit� system. 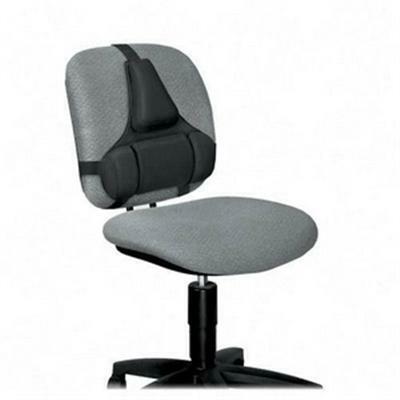 Back Support Type: Chair; Material(s): Plastic; Nylon; Steel; Width: 16 3/4"; Depth: 4 1/2". 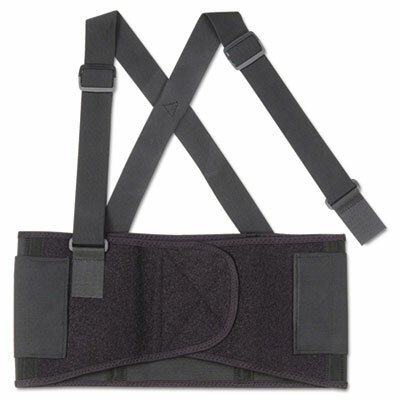 Lumbar support helps ease lower back pain. Orthopedic design helps keep spine in proper alignment. Removable, machine washable polyester/cotton cover. Made of highly-resilient contoured foam. 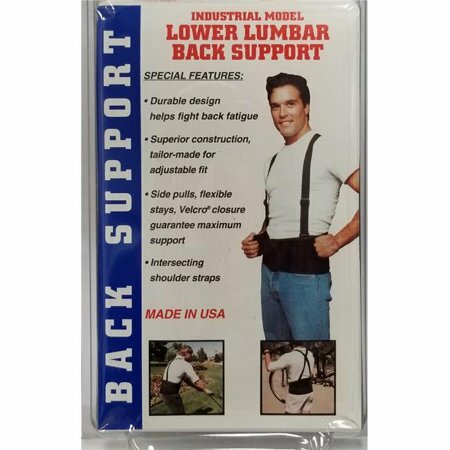 Back Support Type: Lumbar; Material(s): Polyester; Cotton; Foam; Width: 14"; Depth: 3 7/8". 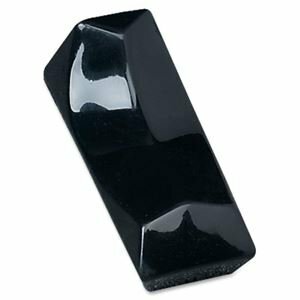 Kensington Memory Foam Seat Rest. Temperature and pressure-sensitive foam This item cannot be shipped to APO/FPO addresses. Please accept our apologies. Single layer 5" elastic cinch strap for positive tension. Adjustable 1 1/2" knit elastic suspenders. Knit elastic body material (7 1/2" width). Machine washable. 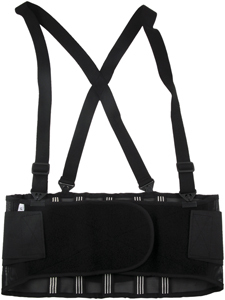 Back Support Type: Belt; Material(s): Elastic; Color(s): Black; Adjustability Features: Detachable Suspenders. Fits either shoulder, keeps hands free. Infused with Microban� antimicrobial product protection. Self-adhesive back for mounting. Comfortable, cushiony, nonslip plastic. For cordless and flat-back phones. 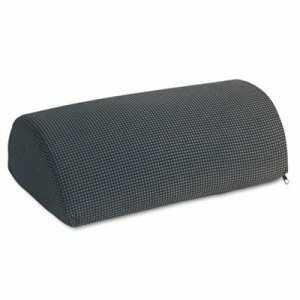 Length: 1 7/8"; Width: 1 3/4"; Height: 4 1/8"; Accessory Type: Shoulder Rest. Fits either shoulder, keeps hands free. Infused with Microban� antimicrobial product protection. Self-adhesive back for mounting. Comfortable, cushiony, nonslip plastic. For regular and Trimline� phones. 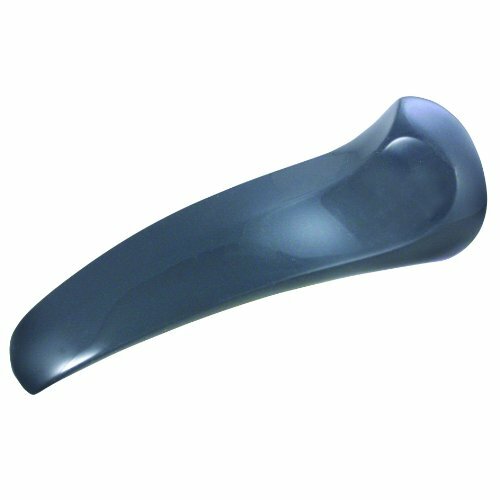 Length: 2 1/4"; Width: 2 5/8"; Height: 7 1/2"; Accessory Type: Shoulder Rest. Soft cushioning gel conforms to your wrist for all-day support. Smooth fabric reduces wrist irritation. Keeps wrists in a neutral position for ergonomic comfort. Classic look matches any d�cor. Wrist Filling Material: Gel; Mouse Pad/Wrist Rest Type: Keyboard Wrist Rest; Color(s): Gray; Theme: Solid Color. Enjoy total comfort with this Viscoflex� memory foam rest that adapts to the shape of your palm and forearm. Contoured edges relieve wrist pressure. Center divot stabilizes the wrist and minimizes movement, providing hours of comfort. Soft Lycra� cover material is breathable, easy to clean and is treated with Aegis� antimicrobial protection. Perfect for use with computer mice, calculators or telephones. Non-skid base. Wrist Filling Material: Memory Foam; Mouse Pad/Wrist Rest Type: Palm Rest; Color(s): Black; Theme: Solid Color. Refresh and personalize your workspace with fun designs! Soothing gel comfort encourages neutral wrist posture. Clear gel is easy to keep clean. Nonskid base will keep the wrist rest in place. 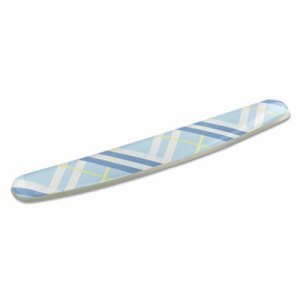 Wrist Filling Material: Gel; Mouse Pad/Wrist Rest Type: Keyboard Wrist Rest; Color(s): Blue; Theme: Plaid. Ergonomically designed to provide wrist support and comfort. Thick gel cushion conforms to the contours of your wrist to alleviate pressure. Stain-resistant covering wipes clean with a damp cloth. Nonskid rubber backing keeps rest firmly in place. 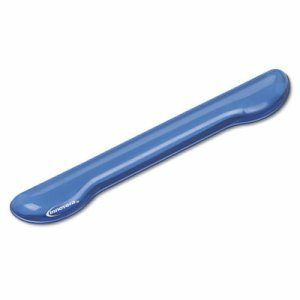 Wrist Filling Material: Gel; Mouse Pad/Wrist Rest Type: Keyboard Wrist Rest; Color(s): Blue; Theme: Solid Color.